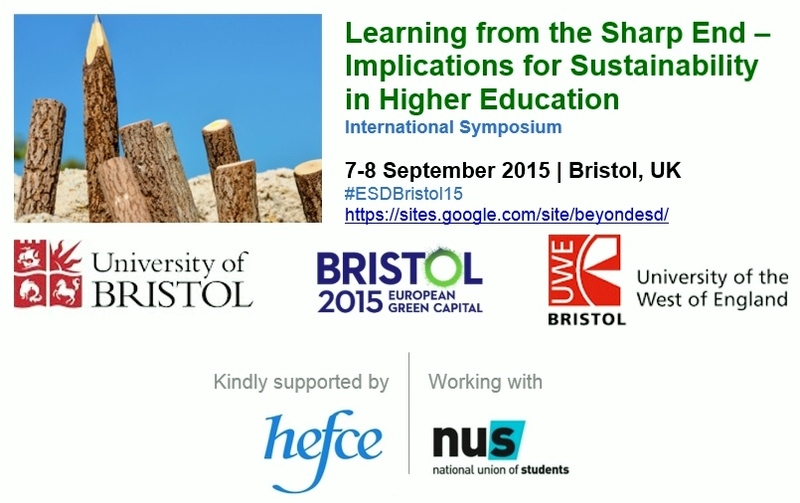 An international symposium titled ‘Learning from the Sharp End – Implications for Sustainability in Higher Education’, will take place in Bristol on 7-8 September 2015. This event, jointly organised by the University of Bristol and the University of the West of England (UWE) and supported by the UN SIDS Partnership ‘Learning from the Sharp End of Environmental Uncertainty’ and the National Union of Students (NUS), is part wide programme of activities for Bristol’s year as the European Green Capital for 2015. Central to the approach adopted by the UN SIDS partnership is the concept of learning from those in the front line of change. This conference will use that approach to learn from those developing initiatives in higher education. The symposium will focus on new ideas to empower and enable students to make a difference and to deliver a more sustainable future. It will showcase the best international experience of engaging students in sustainability learning with an emphasis upon holistic approaches which link student-led activities, the informal curriculum, skills and engagement development in the formal curriculum and the campus and city as living laboratories. It also has a sub theme, namely, Postgraduate Voices – tomorrow’s agenda. The event will include workshops and roundtables and over thirty academic papers will be presented. Moreover, a pre-conference programme will enable delegates to explore Bristol as European Green Capital and contribute to this special year. The two universities are leading a HEFCE (Higher Education Funding Council for England) Catalyst Fund project, called ‘Student Capital: Green Capital’. The project brings together formal and informal curriculum initiatives to test different ways of engaging students in sustainability learning, focusing on how student capital can be harnessed to make a difference to the students and in the community. Contributions to this Symposium will inform the outcomes of that work. Graphic adapted from the symposium website.